Occupying the space left free by vegetation with buildings. This was the intention of the client in this project, a structural engineer who played an active role in the design of his home in Nova Lima, in Minas Gerais. The home was designed by Humberto Hermeto, a young Brazilian architect who has gained a reputation in recent years for his bold compositions of jutting cement that seem to announce the new Brazil’s ambitions to the world . The MR home recently built in Nova Lima, near Belo Horizonte, can also be interpreted in this way, as a building which boldly imposes itself on its site with generous use of brick and cement, as an unmistakeable sign of the power and wealth that is still in the hands of a privileged few in this country. On the other hand, it presents a floor plan that distributes its volume, lightening its presence in its context and giving the whole landscape great harmony. The C-shaped plan underlining the form of the hill creates irregular spaces in the home, fluid spaces which are interconnected, underlining the home’s preferential relationship with nature with rooms that extend out towards their surroundings wherever the existing vegetation permits. Abundant, luxuriant palm trees and other tropical plants were left intact wherever possible, while the building seeks to venture into the forest and become a part of it, taking into account its spontaneous growth in the years to come. 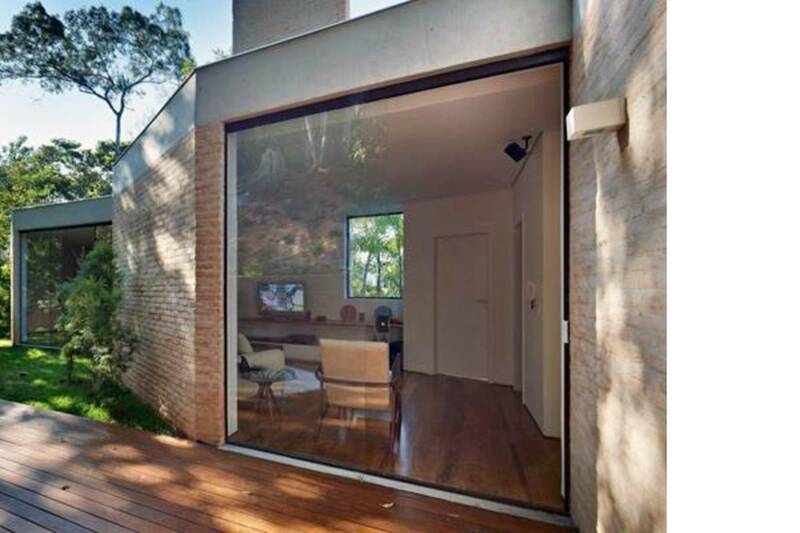 The clay brick walls structurally support the thick cement roof and act as a similitude: the hues of bare clay immediately relate to the earth and the home’s natural surroundings, consistently with application of wood for the flooring indoors and in the courtyard, where a paved path flanks the house and accompanies visitors as they discover the garden. The home’s inseparability from its natural surroundings, accentuated by the interval between the walls and the floor to ceiling windows, testifies to the Brazilian attitude that a well-cared for, luxuriant garden is an extension of the home in a climate which is particularly temperate at any time of year. Use of imposing cement slabs, which jut out in places such as the pedestrian entrance, draws on Brazil's modernist architectural tradition but is also, as Hermeto points out, due to the fact that cement costs less than steel. The home’s interior is arranged on two levels: a small guest suite and a garage in the basement, with a sheltered walkway through the forest on ground level, in which glass walls eliminate the boundaries of the home. The complex living area, with a lounge, dining room and kitchen, accompanies the bedroom area, in which every room, with its own walk-in closet and bathroom, is a peninsula extending out into the garden which surrounds the home on three sides. While the private areas are reserved and independent, the common areas are entirely public, communicating with one another and the natural setting around them.On the outside, next to the entrance to the courtyard, there is a large outdoor kitchen with a barbecue grill: a very common feature in Brazilian homes.